Valerie Mih is an animated filmmaker with a wide range of both studio and independent production experience. Commercially, she has animated for Pixar Animation Studios (Toy Story II, Geri’s Game, A Bug’s Life), Lucas Learning Limited (Star Wars Math), WildBrain (Hershey’s Kisses) and game companies (Electronic Arts, Rockstar San Diego). She has independently produced/directed animated shorts for PBS and the festival circuit (Paper Peace, Harmonize, The Pet’s Zone), as well as a half-hour animated documentary (EINSTEIN, awarded best animation at the International Festival of Cinema and Technology). A committed educator, she has taught animated filmmaking at the undergraduate and graduate levels for over ten years. Prior to joining the faculty at ACM, she served as the faculty lead for the M.F.A. program in Computer Animation at The Art Institute of California – San Francisco. Valerie has received grant support from the Silicon Valley Arts Council, CPB/PBS Producers Academy, Center for Asian American Media and the Independent Television Service. Her independent work currently focuses on exploring the storytelling mediums of interactive books and films through her digital publishing imprint, See Here Studios. A trained classical and jazz musician, she often composes the music for her productions. Valerie holds an M.F.A. in animation from the University of Southern California School of Cinematic Arts, where her student film PETS was awarded a student Emmy, and a B.A. in American Studies from Stanford University. 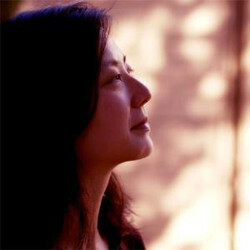 She is currently Assistant Professor at University of Hawaii’s Academy for Creative Media. The Fellowship meant appreciation on both emotional and financial levels. It was a wonderful shot in the arm and validation to continue creating new work. Persist in pursuing your art and craft. Real or perceived obstacles will dissolve over time.